Sushmita and Sughra at the launch of Thou Art at Studio Pause. Photo by Mary Louise Marino. Thou Art: The Beauty of Identity, is a community poetry book I have created in collaboration with Afghan artist Sughra Hussainy. It is inspired by the art, the words, and my meeting with Sughra; and the experiences of the members of the Studio Pause community. The anthology contains poems about identity written by 26 writers—seasoned poets and first-timers, activists and artists, business owners and educators, researchers and high-schoolers, social scientists and founders of charities, politicians and musicians, international students and retirees. 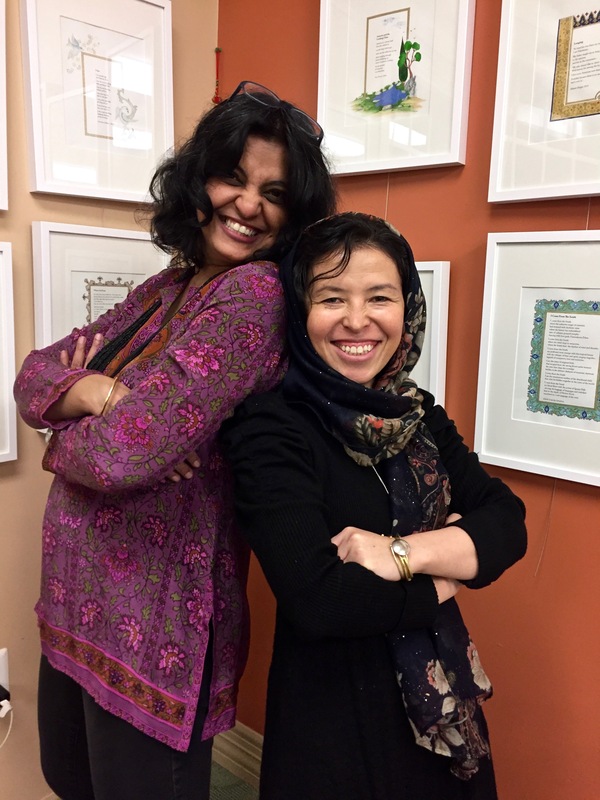 Each poem is decorated with traditionally Afghan miniature paintings and illumination by Sughra Hussainy. And each poet gets to buy their decorated poem artwork at a price that works for them, owning art by a very accomplished Afghan artist they have met. Each copy of the book will be printed and hand-bound by me in my studio and comes in a set of two—one to keep and one to give as we don’t know who would benefit from reading this book. The project started in Oct 2016 and the books will be available in April 2017 to celebrate National Poetry Month. The project has also inspired a community poetry book project in a local school, and at a local library fest. There will be a show of the artworks with a reception, reading and bookmaking workshop too so keep reading. Details below at Event section. Oct 2016: Studio Pause Meeting See Photos from Sughra’s first meeting the Studio Pause community. Nov 2016: Freer Sackler Blog: Read the full story of the collaboration on the post I wrote for Bento, the Freer and Sackler Gallery of Art blog. March 2017: Indiegogo Fundraiser Join in and support the project here! The awesome film is by Studio member Susan Sterner. April 2017: Virginia Foundation of the Humanities The story of the collaboration and the project, The Road from Afghanistan, written by VFH’s director of community programs, David Bearinger, is featured on the VFH website’s Global Virginia page. Aug 2017: Turning the Page/Reading Rockets/WETA Sushmita and Sughra were invited to do a workshop for Turning the Page’s summer program for DC families. Check out the blog post, Not Just for Kids, on the Reading Rockets page, the organization who supported the project. 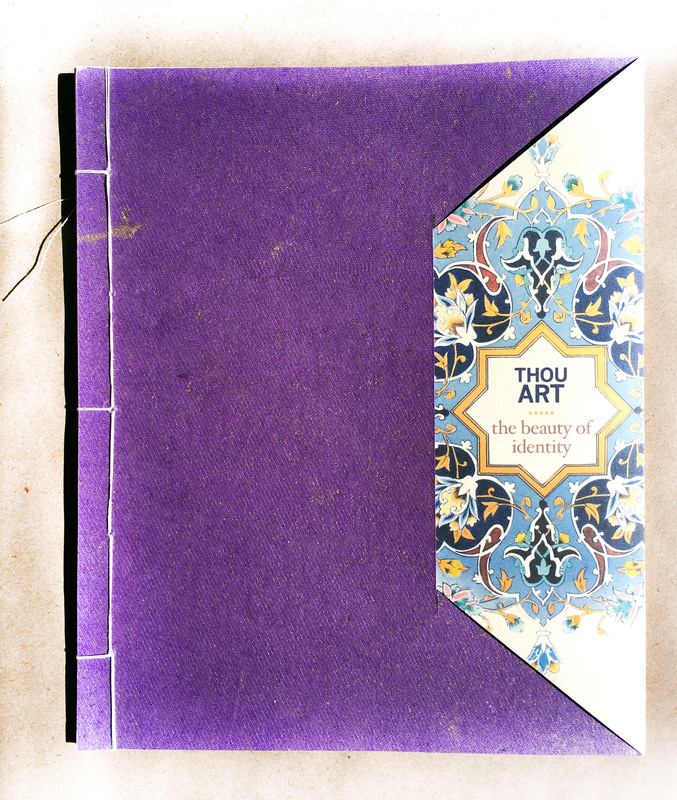 Thou Art at home or at school: Download the Thou Art activity worksheet here StudioPause_Thou Art ActivitySheet! Order your set of Thou Art: The Beauty of Identity here! $35 for a set of 2 handmade poetry books, one to keep and one to give. 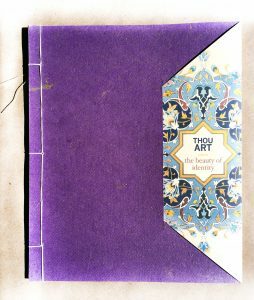 Sushmita is using different colored handmade paper she has brought from India for the covers so the books don’t all have purple covers. Each book will have a different cover so keep the one you like and gift the other! Qty: 50 sets Sold Out! Second Edition: After a wonderful extended first edition which came with a free second copy paid for by our Indiegogo fundraiser we now offer the second edition of Thou Art: The Beauty of Identity. It comes with an added page with a little about the project’s journey. $35 for 1 copy of the handmade poetry anthology. Limited quantity. 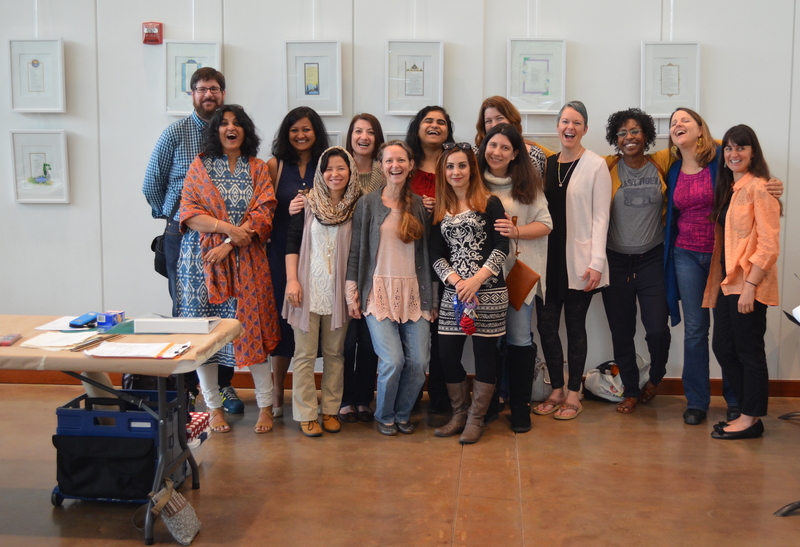 Thou Art poets with Sughra at the show reception, reading, and bookmaking event at UUCA, April 2017. Howie, Rosa, and Eva were there too, reading with the 13 in the photo above. Meet the poets and artists who worked on this project PLUS bring your art, songs, poems etc. on Identity to share at the Mic-Less Night hosted by Hanan Seid, our studio artist-in-residence and slam poet. Photos: See photos from the Launch here. Thou Art kicks-off “We Are Poetry,” the Oakridge ES Community Poetry Book inspired by Thou Art, Oakridge Elementary School, 1414 24th Street, South, Arlington, VA 22202. 7:00pm – 8:00pm. 12:00pm – 4:00pm. More on the library website. Photos from the event here. Thou Art will participate in the concert to support the work of the Dream Project, VA, and raise funds for scholarships. And also an invitation to remind everyone about the importance of each voice and each story. Join us to enjoy music, art, and write some poetry of your own! An exhibit of original book pages from Thou Art will open at Virginia Foundation for Humanities, Charlottesville, VA. 145 Ednam Drive, Charlottesville, Virginia, 22903.